I'm trying to keep studded tires in stock for your winter riding pleasure. My favorites are the Schwalbe line up. There's just nothing better. However, the USA warehouse is back-ordered on several models. Long and short, call or write and ask me what I've got in stock before you drop by. 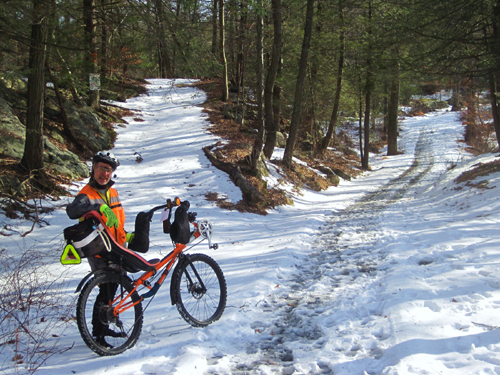 This is a photo of the inimitable Neile Weissman, ride leader extraordinaire, on a winter ride on his mountain recumbent. Could he be scouting a ride for the New York Cycle Club (http://nycc.org/)? His bike is the original Rans Enduro that was discontinued for some mysterious reason. Great bike for mountain riding. Closest we have to it are the HP Velotechnik Street Machines or the Volae 26x26 Expedition series bents. It takes some work to set up the Volaes with fat studded tires AND fenders (just studs, no problem). And however much I love Street Machines, which easily take studs and fenders, I'd prefer a dual 26" for mountain riding. Still, this is a good example of the SM's flexibility and another reason it's one of the world's best bents. I ride a old year 2000 Challenge Distance with dual 26" wheels, looks very much like your bent. I've tried riding with studded tires but can't manage to keep upright, constantly slipping and sliding even on flat roads. I also have a LWB bent dual 26" which I've tried my studded tires on and again have great difficulty handling the slippery conditions. I don't know how you manage this? I like the Scwalbe tires also, cost nearly as much as my car winter tires though. I only recommend the Schwalbe studded tires.